If you have back pain, you may benefit from chiropractic care provided by Arizona Chiropractic & Holistic Health Center, serving Scottsdale, Arizona and the surrounding area. Chiropractic care is a traditional, non-medicated approach to health care that focuses on getting to the root of the problem. And at Arizona Chiropractic, we believe in taking a modern approach to the traditional. Chiropractic care is an alternative medical approach that consists of a specialist correcting "subluxations," which occur when the vertebrae in your spine shift, leading to pain and pinched nerves. Typically, chiropractic care uses a combination of manual manipulation and exercise therapy to get to the root of the problem, so you no longer have pain and are able to move comfortably. What Does Chiropractic Care Treat? Chiropractic care is beneficial if you have lower back or neck pain, including whiplash. We also treat pain in the middle of your back using chiropractic care. In addition, it's possible to treat conditions not related to the musculoskeletal system, such as asthma, dizziness, disequilibrium, attention deficit hyperactivity disorder (ADHD), low energy levels, headaches, migraines, ulcers, or asthma. We help those who've suffered from a work-related or sports injury. We even assist after people get into car accidents. We do perform a spinal alignment, which is a treatment where our chiropractor moves your spine, so the discs and vertebrae realign with one another. 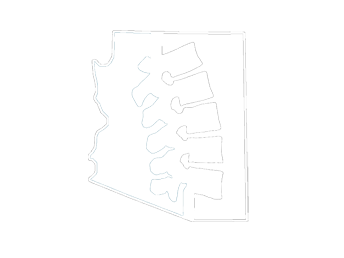 One of the most common techniques used at Arizona Chiropractic is the diversified technique, which consists of a chiropractor realigning the spine manually, but all movements are low-amplitude and high velocity, meaning movements are forceful, but not hard and damaging. The deep thrusts often cause the "popping" noises people associate with chiropractic care. Our chiropractor also uses a device-assisted technique known as the The Activator Method. This particular alignment uses a tool known as the Activator Adjusting Tool, which is a spring-loaded, handheld mechanism that applies quick, low forces to your spine. It places the segments of your back in place, in particular, in your lower to middle back and pelvic region. The Activator Method uses a small, hand-held instrument called the Activator Adjusting Instrument to deliver a gentle impulse force to the spine with the goal of restoring motion to the targeted spinal vertebra or joint. Our chiropractor uses the drop-table technique, which requires a patient to lay on the table while the chiropractor uses the table to raise his or her body about one-quarter of an inch. Next, the chiropractor drops your spine back down to realign it. The table eliminates the need to move you during your alignment, so you experience limited discomfort. Chiropractic care is all natural. Typically, you won't experience any side effects, except for possibly minor discomfort that goes away over time. This particular treatment works with your body to get to the root of your problem. It doesn't mask it like pain relievers do. Schedule an appointment with Arizona Chiropractic & Holistic Health Center, serving Scottsdale, Arizona and the surrounding area, by calling 480-585-5577.